- Are you guys trustable? Can I see your Feedbacks? We have completed several hundreds of orders with 0 negative feedbacks. All of them were positive and we can proudly say that our service is one of the best around. You can check them HERE. - What regions is your service on and when can you perform the order? We operate worldwide ( EU - NA - KR ) and all orders are started within minutes! - Is my account safe? Our boosters know how to handle every situations: they will never reveal anything to anyone, so there is a 100% safety factor from us. We treat your personal data such as account, email, gamer tag through Https protocol, providing the ultimate security! In case your account is banned during the leveling/boost we'll be compensating by providing a new account, only if that's imputable to us. 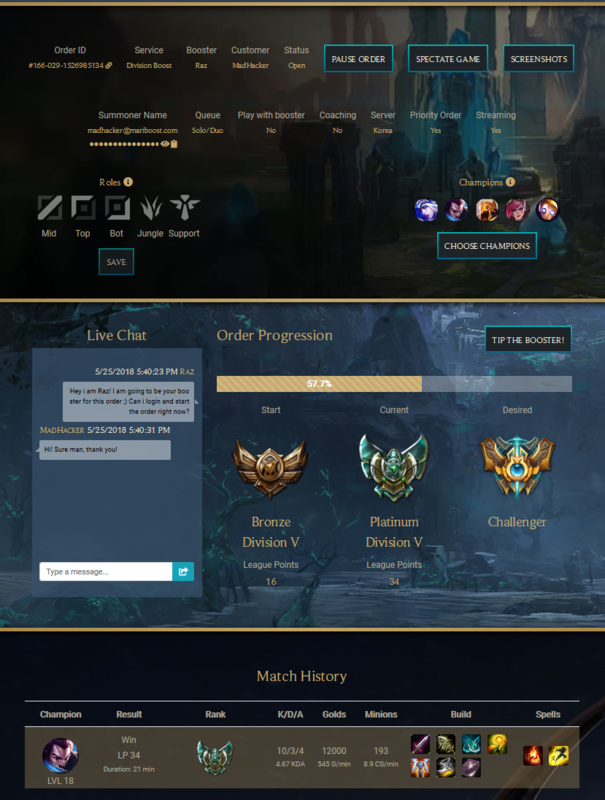 Recently went through this boosting site and It wasn't one of my better experiences, my booster was was unhappy with the champs I had and kept seeing If I would buy more, he played 4 games in a span of 24 hours which at that rate it would have taken a week to complete my order. After talking to live chat and asking for a new booster they said my original booster will complete the order even though in the FAQ it says I may ask to switch and they will figure it out (false). The champ pool should not matter, I have gone through 2 other sites before this one and not one had a problem with the champ pool. Hello, i'm sorry you've found yourself not completely satisfied with the service that has been provided so far. The correct number of games played is more than 20 in 48 hours. The booster can be changed for a valid reason and I also confirmed you this on the live chat, if you are not satisfied with him, he will be changed for a new one. I was just reassuring you that the order will be completed and no further issues will raise, but we didn't have time to discuss since you left the chat and came here to post this. We'll be waiting for you on the website or your order's page to complete this order. He kindly asked if you could provide a slightly wider pool of champion since this one is not very generous, if not, no problem. The service was just trying to reassure that the booster was going to finish the order, not implying that we wouldn't have changed it. I'm sorry there was a misunderstanding. The order will be completed without any more problems nor misunderstanding.